Ever since I saw that Cashmerette was offering their patterns via Sprout Patterns, I was intrigued by this service. 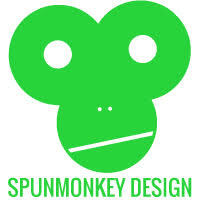 I watched from afar for about 2 years as blogger after blogger made patterns and bags they had sourced from Sprout and when they were offering a discount for Me Made May, I decided to take the plunge. What kept me from trying this service sooner you may ask? Well the answer is two fold. I’ve only had one experience with Spoonflower fabrics (back in 2013) and it was less than ideal. Some fabric that looked black on my screen arrived pale gray, not exactly what I was after. Secondly, the price. Let’s use the print I went with for my Kielo as our example. It’s a cotton spandex jersey that is sold for $26.75 per yard. For comparison, Art Gallery and Robert Kaufman knits are made of the same fiber components and go for about $17 per yard. In the case of my Kielo, 3 yards of cotton spandex jersey were needed, so on the regular Spoonflower site that would have cost me $80.25, but using the Sprout service brought my total up to $92. I couldn’t find anywhere on the site that specifically calls out the cost breakdown between the fabric and pattern, but by doing a little math and research I determined that in this case the pattern cost me $11.75. My order included an original PDF pattern with all sizes of the patterns so the $11.75 for the pattern would have been a savings, but I already have the paper version so technically I’ve bought the pattern twice now. That price for the PDF is itself a savings over the regular cost of the PDF so be aware of this savings if you are planning to try a new pattern with Sprout. My Kielo came together really well and using the Sprout printed version of it saved me quite a bit of time. I think turning the belt pieces to the right side took me longer than any other piece of this project, but at least I didn’t have to trace my pattern pieces! I tend to forget to include all of the markings when I make a pattern so using the Sprout version also saved me from myself because all of the notches are printed in place. I love the print that I chose and would never have been able to find that in a store (I’m tempted to order yardage of it in another substrate from Spoonflower, that’s how much I love it). You even get to determine the placement of the fabric on a 3D model, it’s pretty cool and can help prevent weird placement in the bust area. My pattern arrived really fast. On their website they say it can take 6 days for your order to ship, but mine must have been quicker because I placed the order on 5/24 and received it on 5/31. I love a quick turnaround on a sewing project! This project was a knit so I wasn’t too worried about needing to make adjustments, but that’s a negative to Sprout Patterns to consider, you can’t make adjustments before cutting your fabric. My suggestion would be to order up a size if you are worried so you at least have a little wiggle room to make adjustments somewhat on the fly. For example, after 4 tries I have the fit of the Archer Shirt right for me so I know if I were to get it on Sprout I’d have to order the size 18 even though technically my size is a 14. I need the 18 for the sleeve length and in the bust. I could then increase my seam allowance everywhere in the pattern that I’ve previously graded down. And now, I leave you with a picture of me in the final dress! For any New England Patriots fans out there, I met (for the second time in my life) former player Matt Light while wearing my Kielo this summer. Gentleman Prefer Blondes famously taught the world that diamonds are a girls best friend, but I disagree. When you can paper piece 20 jewels, who needs a diamond? Faceted Jewels II is my second project from Amy Garro’s book, Paper Pieced Modern and I am so thrilled with the finish. If you want to learn paper piecing, buy this book!! Or even better, take a class with Amy. She visited my guild in 2016 and was a fabulous teacher. Both quilts I have made from her book are made up of one block which makes the cutting process nice and straight forward and you can get into a nice rhythm. If you’re thinking about getting into quilting I highly recommend foundation paper piecing. You sew over paper which helps you to be accurate, but also creates really great points. Plus, pulling the paper off at the end is so satisfying! Basically, whatever your skill level is, I think you need this book! I’m so excited to share this quilt with the world today! I’ve been hard at work on it for over a year. This quilt top took me over 60 hours to piece and it was truly a labor of love! My grandmother saw this quilt in the book before my class and said, “Why can’t you make this one in the class?”, well now I have and I hope she’s proud with the outcome from her sewing room in heaven! Here are some of my progress shots. Each block has 44 pieces so in the end this quilt is made up of 880 pieces of fabric, holy seams! You don’t truly appreciate the value of a good iron until you’re working on a quilt with this many seams if you ask me. I used Kona Snow for the background and 3 Kona blues and 3 Kona greens. I started with one green and one blue that I thought looked good together and then I used my printed Kona card (this one is similar) to choose variations of those colors. Each block has 4 quadrants so for mine 2 of them are blue and 2 are green. I knew I wanted to send this quilt out to a long armer almost as soon as I got started. I sketched out so many concepts for this quilt and in the end decided on what I’ve dubbed ‘The Emerald City”. I was inspired by the shot from The Wizard of Oz when the gang first see’s the Emerald City. I filled in the white space in my sketch with windy motifs which to me make me think of the Wicked Witch on her broom. After marathon sewing sessions all last spring to get the top done, I sent it off to be long armed by Lorri Wurtzler, of Seventh Heaven Quilting. Lorri is a fellow member of the NHMQG and she knocked it out of the park! Here’s a closeup of the quilting that is amazing! Once I got the quilt back from her I let it sit for months before I attached the binding. Luckily my guild is having a WIP contest so I was encouraged to get it finished. Now it’s on and the quilt is ready to be loved! Here’s Ryan enjoying the quilt even without the binding in place! After I got the binding on I ran around our condo complex one morning trying to find things to hang it on and get some pictures. How did I do? This post has been a long time coming, since October 2016 in fact! I just kept making more versions of this pattern and said I would wait until I finished this one or that one to write the blog and it just became this vicious cycle and today it ends! It’s a happy ending though, 5 Happy Harrison Shirts. I’ve made it in Liberty Lawn, Liberty Art Print, Chambray, and even Quilting Cotton and there has yet to be a version that I don’t love. Do you want to hear all about my different versions? Read on! You can read all about my first Harrison shirt in all her glory here. After the pattern was released Jenny created an expansion pack to turn the shirt into a dress. 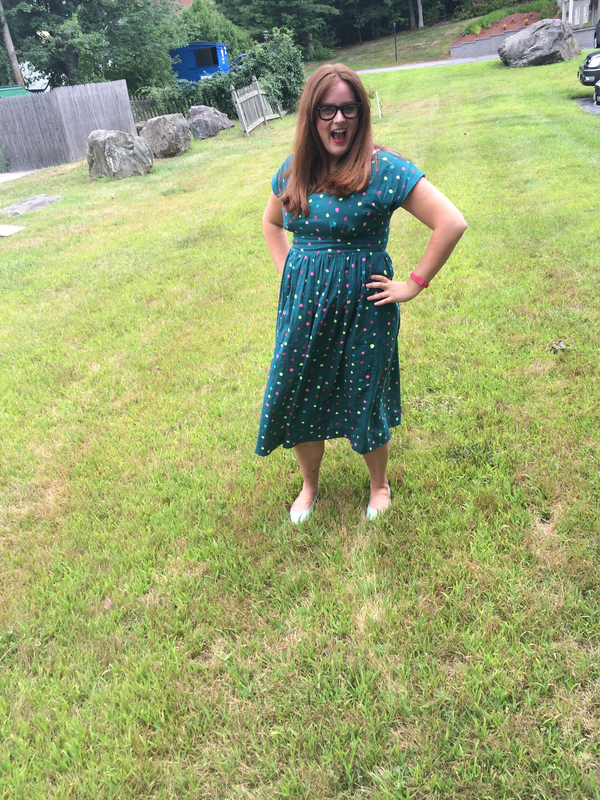 I tested the expansion for her and have a great Liberty Harrison Shirt Dress to show for it! I wore this dress when I was interviewed by Chronicle and if you’re interested to watch that you can find it here! I really love this fabric, it’s pencils! I do a lot of writing for my job so I felt it fitting that I should have a dress with pencils on it. At one time ModCloth has sneakers made from the same fabric and a little piece of me regrets that I didn’t buy them! This fabric is long gone, but came from Guthrie Ghani. Next up is a Liberty Lawn version that I got at Pintuck & Purl! I absolutely love my purple sleeveless Liberty Harrison Shirt; I love the color, I love the buttons (recycled from a ripped J.Crew cardigan) and I love this goofy picture of Ryan and I while I’m wearing it. I can actually be seen sewing this version during my Chronicle segment so this shirt is practically famous! It works with blue jeans, my burnt orange jeans, my purple jeans and a pair of purple chino shorts from the Gap. It works with a cardigan over it or a Sewaholic Renfrew under it. It’s basically my favorite shirt because I can wear it with anything. Another classic print turned into a classic sleeveless top, I actually wore this Liberty of London Harrison while I was in London at the Victoria and Albert Museum. Here’s a picture of Ryan and I avoiding the rain in a yurt like structure that was on display in the garden. This makes me want to go back to London right now! This fabric also came from Guthrie Ghani so basically it crossed the ocean to get to me and then came back across the ocean with me, I wish I traveled as much as my clothes! Speaking of vacation, you know how before a vacation you decide you need to make all new clothes? Or is that just me? Well this Carolyn Friedlander Harrison Shirt was intended to be taken to London last summer, but I didn’t finish in time. I did have it done in time to wear on a wine tasting trip to California in November though, how nice does it look under my orange safety vest while Sean and I toured the J.Lohr winery? During One Week One Pattern I tried to get creative and not just wear my shirts as is, so here you also see the shirt popping out from under a Renfrew for a pop of color! My Rifle Paper Co. Menagerie Harrison Shirt is another expansion pack test. Jenny created a full bicep adjustment for the pattern and her timing could not have been better. On the 16th of October I cut out this fabric to make a short sleeved Harrison Shirt and on the 17th of October I got an email from Jenny that she was toying with the idea of a full bicep adjustment for the sleeve. Of course I offered to test and recut my sleeves! My long sleeved version wasn’t super tight in the arms, but I was after slightly more room. This version made it out to California as well! So that’s all for now, but believe me when I say that there will be more Harrison shirts in my wardrobe in the near future! I’m thinking another chambray version and a rayon, but we shall see! It’s time for another riveting installment of my goals for 2018 update! I spent a lot of time researching appliqué techniques in February in preparation for teaching myself how to do needle turn appliqué! I’m going to start with the Aeriel Grove pattern from Savor Each Stitch, which is a rather fitting title considering my goal. I’m going to use all of my Carolyn Friedlander scraps for the circle shapes and a low volume print of hers for the background. I’m going to take it one row at a time and see how I do. I anticipate this becoming a wall hanging or table runner, not a full quilt. I also borrowed Heather Jones book, Quilt Local, from my library and started noticing things all around me that I could turn into quilts. I spent a good 4 hours plotting out an idea that was inspired by Broadchurch and I found that process to be very satisfying. I’m still working on the math so we’ll see how it goes. I did some more hand work this month, this time with quilting. I can’t share what yet because it’s a gift for a very social media savvy human being, but it’s coming together very nicely and was the bulk of my fabric used this month. I haven’t finished any of the UFOs yet, I am clearly suffering from “shiny object syndrome” and keep buying new fabric that gets used immediately, while precut projects are left in their newly organized spaces. I will get better with age and March is my birth month so this is my month! I made one Renfew for myself this month. I love that pattern so stinking much! Sometimes I see a fabulous knit fabric and just have to make it into a Renfrew because I know the fit is great and the pattern itself has the arm and waist bands that you can use or not, depending on the look you’re going for. I did not do so well at this goal yet again. I purchased 29.5 yards of fabric in January and 44.5 yards in February and have only used 23.25 for the year. My goal within this goal is to at least get my used number to be higher than the purchased number and the month of March includes two guild sewing days so I have high hopes. I’m not really proud of this, but when I heard the announcement that Free Spirit was closing I panic purchased some Tula Pink and Anna Maria Horner. I’m so glad they were acquired and won’t be closing after all, but now I have about 9 yards of fabric with no immediate plans! The Cone Mills factory in North Carolina also closed in January so when I found that ThreadBare had a lot of their varieties still I stock piled those. All in all, 16.5 yards of fabric were what I’m calling panic purchases.